The 977-acre C.L. 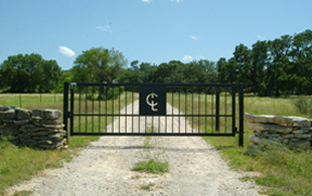 Browning Ranch is located in Blanco County in the Texas Hill Country. Sixty miles north of San Antonio and forty-eight miles west of Austin, it lies on the eastern edge of the Edwards Plateau, part of the southernmost Great Plains. Some 140 to 570 million years ago, this area was a shallow inland sea that covered much of Texas. When the water receded 140 million years ago at the beginning of the Cretaceous period, thousands of feet of sediment brought in by the sea and embedded with marine life solidified into limestone. In the Miocene period 10 to 20 million years ago, this limestone sea floor was uplifted 2,000 feet, creating the Edwards Plateau and Balcones Escarpment. The erosion of this relatively soft porous stone created the thousands of canyons and creek beds that characterize the Hill Country. Browning Ranch, which lies along the south bank of the Pedernales River four miles east of Johnson City, is a mosaic of thick woods and open grassland. Honeycut Hollow Creek, a tributary of the Pedernales River, flows from south to north the entire length of the ranch. With an average of 30 to 32 inches of precipitation annually, the ranch has a drier, cooler climate than the subtropical areas east of the 90th meridian (its precise geographical coordinates are 98°204″ W and 30°1549″ N). Both droughts and flash floods are common. Two woody species, Ashe juniper (Juniperus ashei), locally called cedar, and escarpment live oak (Quercus fusiformis) dominate the landscape. The juniper in particular absorbs water through its roots, and its dense evergreen leaves allow rain to evaporate before reaching the ground and underground aquifer. The resulting soil erosion lowers the water table, which in turn inhibits the establishment of most herbaceous species, particularly deep-rooted grasses. Nevertheless there is a rich biological diversity due to the varied topography, geology, and vegetative cover, factors conducive to the creation of several kinds of ecological niches. 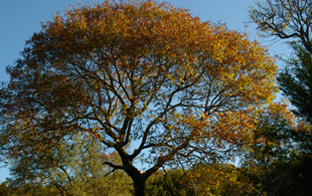 Texas red oak (Quercus buckleyi). The topography of the ranch is formed by intermittent beds of limestone and marl, giving the area a stair-step appearance. The two dominant geological formations are Glen Rose limestone and underlying Hensel sand. This ridge-and-valley landscape constitutes a series of drainage basins, with small tributaries flowing into Honeycut Hollow Creek after occasional heavy rainfalls. For the purposes of collecting, recording, and measuring data, we have divided the Browning Ranch into eight local watersheds, two meadows, three former agricultural fields, and the Honeycut Hollow Creek riparian corridor.